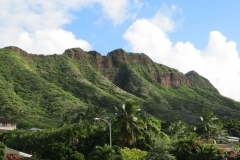 The Hawaiian Islands were formed by volcanic eruptions and on all of the islands you’ll find cones, vents, and eruption flows within the lava rock. 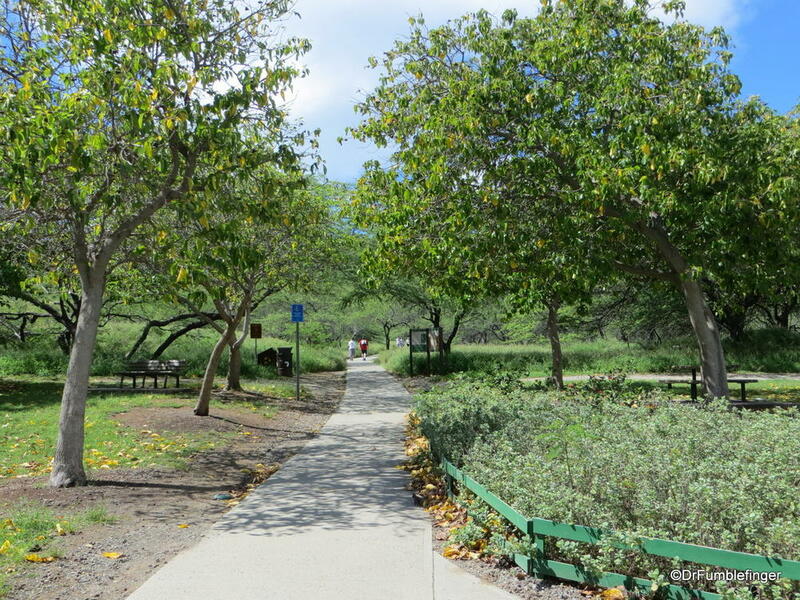 These are all dormant except on the Big Island. 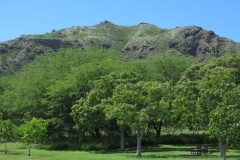 Diamond Head is among the younger volcanic structures on the island, estimated to be about 400,000 years old (in contrast, Oahu’s Ko’olau Mountain Range is estimated at 2.6 million years old). 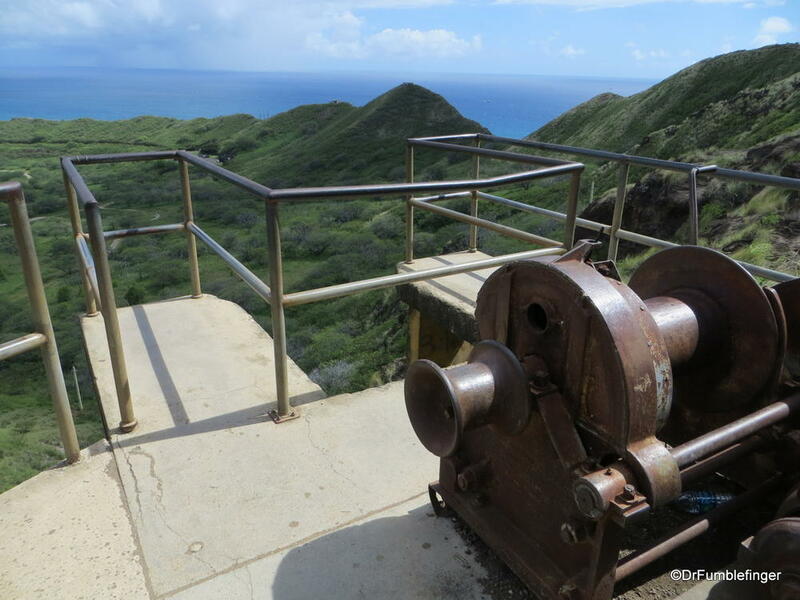 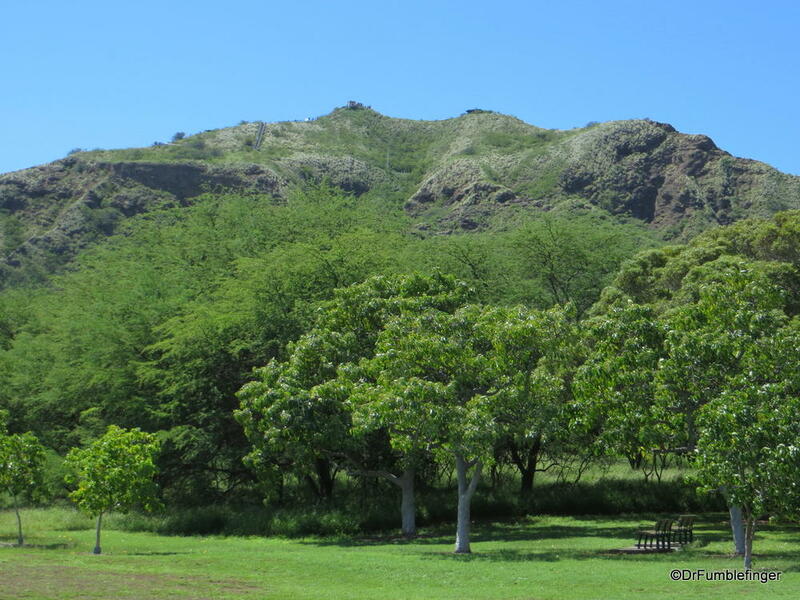 The interior of Diamond Head’s crater was home to Fort Ruger, the first US military reservation on Hawaii. 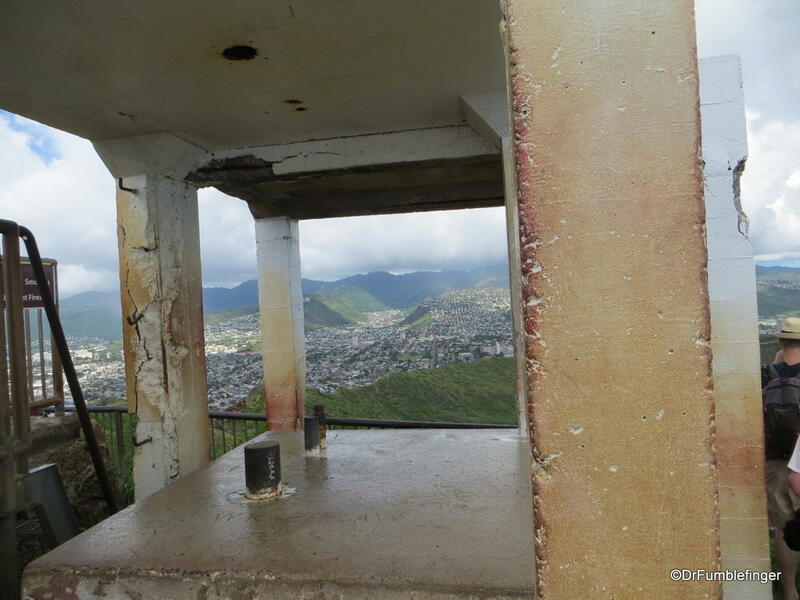 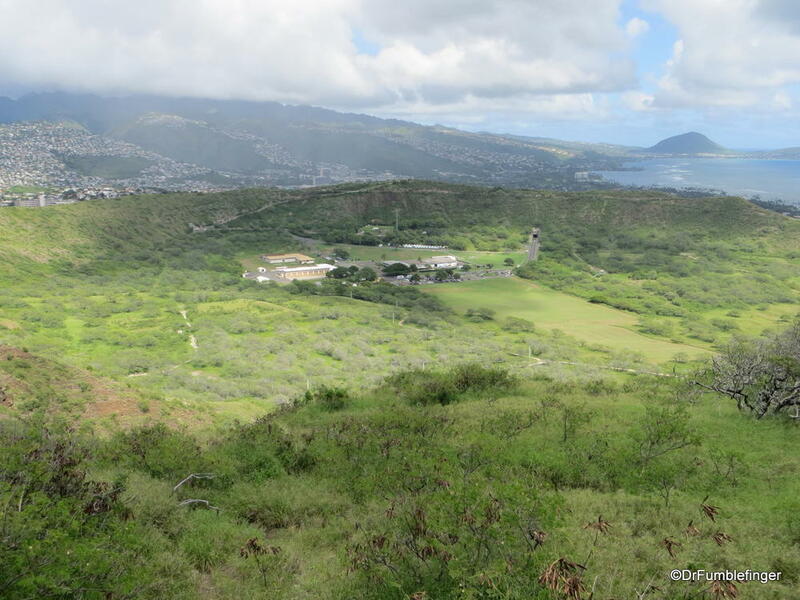 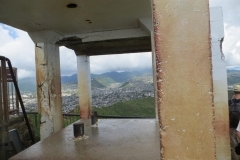 The crater was used as a strategic military lookout in the early 1900s because it provided great views of the south shore of Oahu. 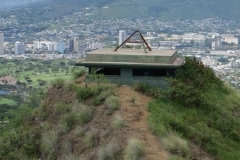 A trail to the summit was built in 1908 as part of the coastal defense system, which has now become a popular hiking trail. 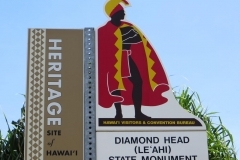 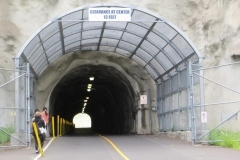 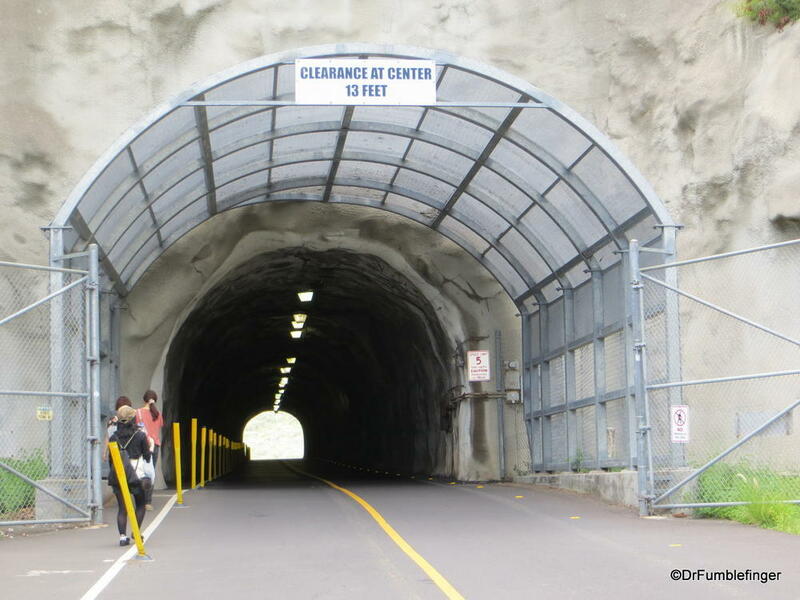 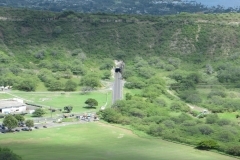 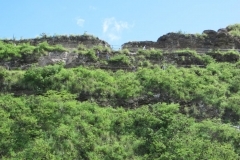 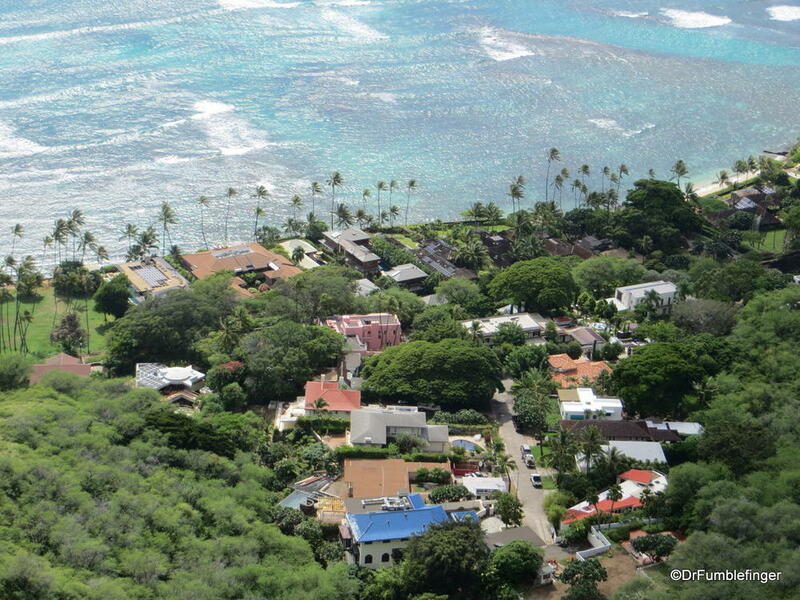 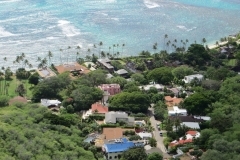 An active National Guard facility and Hawaii State Civil Defense remain within Diamond Head crater to this day. 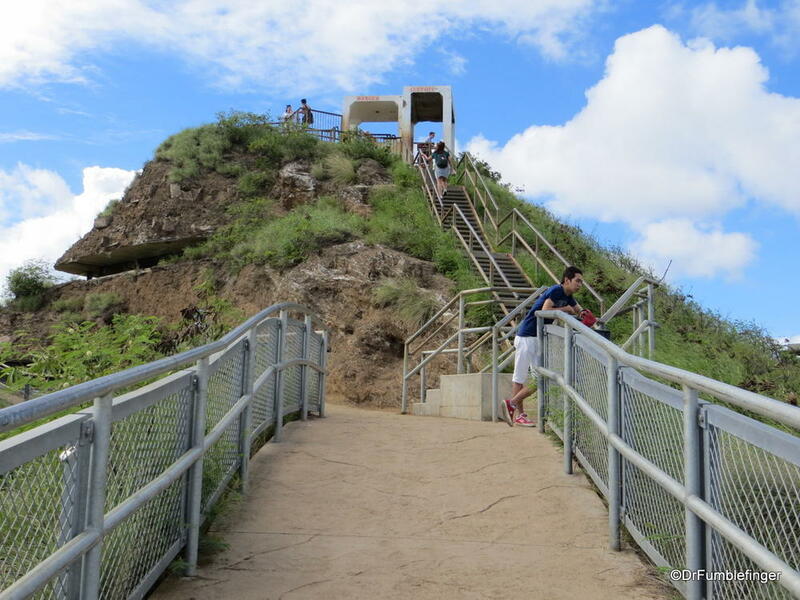 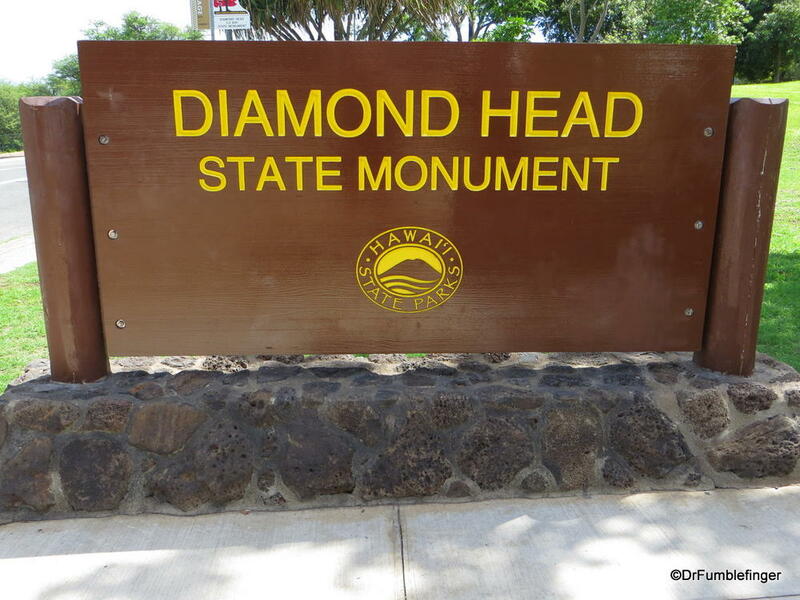 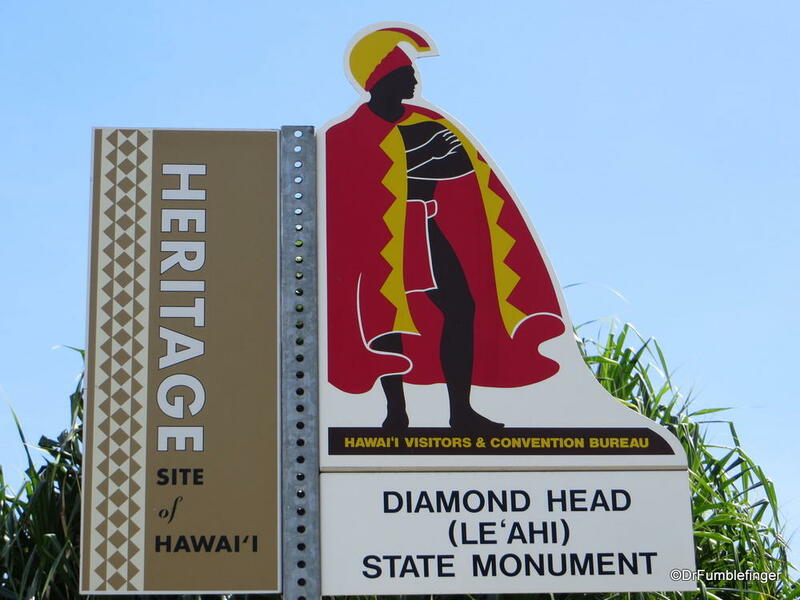 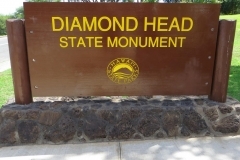 We walked to Diamond Head from our hotel in Waikiki several miles away, but you can also take a bus or car to the trailhead within the crater. 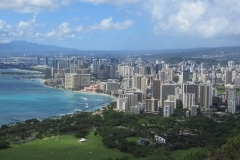 I’d recommend the walk from Waikiki if you have the time and energy. 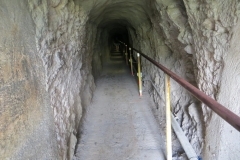 Our walk lead us uphill and through the wall of the crater via a tunnel. 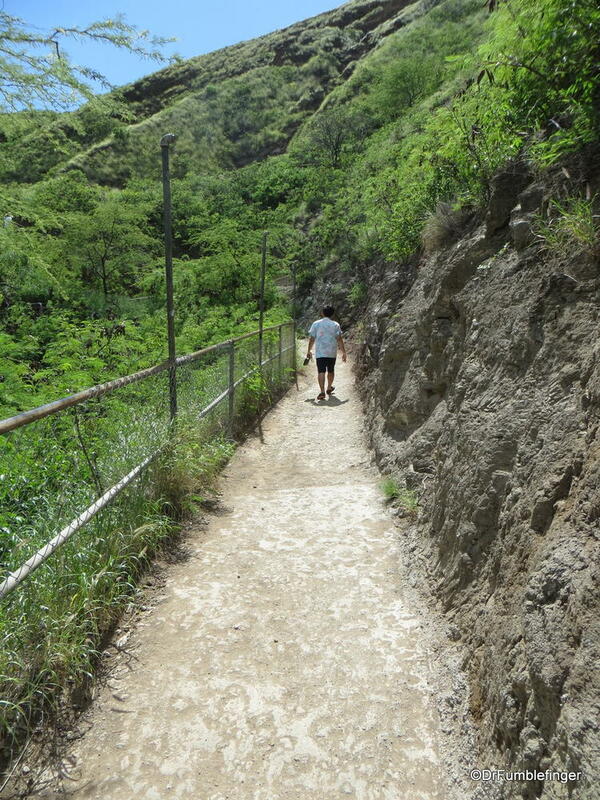 The journey from the trailhead to the edge of the crater’s rim is just 0.75-mile (1.1-km), but it’s not a cake-walk. 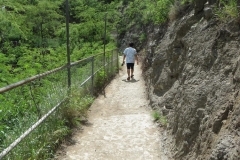 The walk is a hot one unless you do it in the early morning, so be sure you carry a bottle of water. 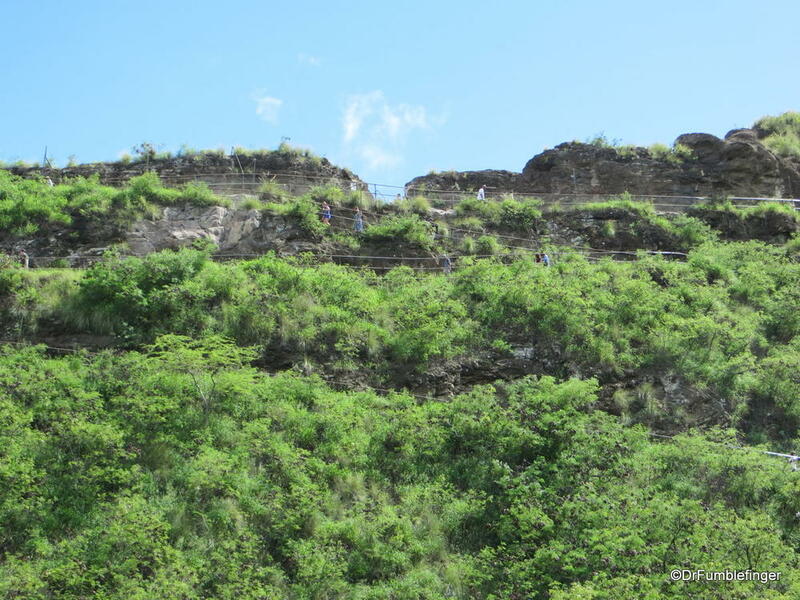 While it is short, it’s steep so the round trip will likely take a few hours, depending on how long you want to linger and enjoy the amazing views from the rim. 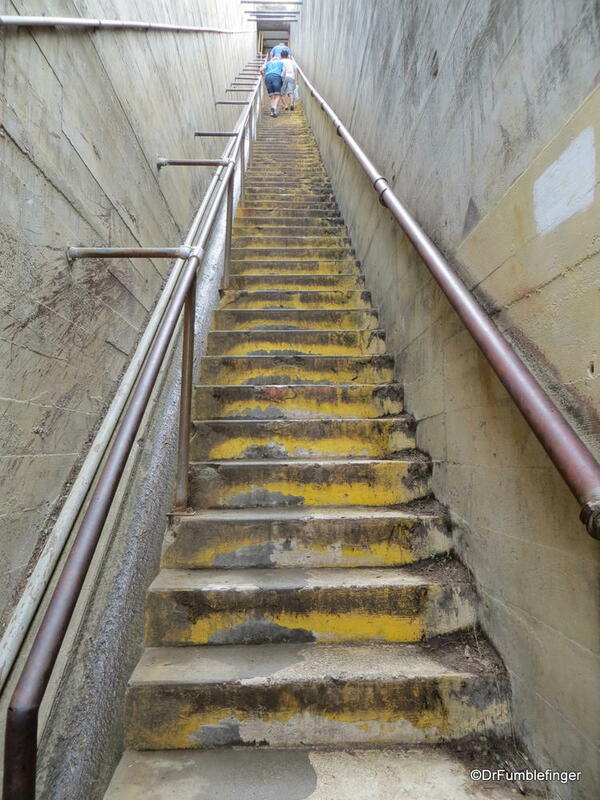 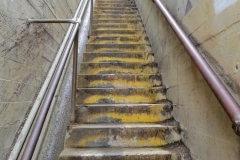 To reach the rim you need to climb several flights of stairs, the longest containing 99 steps, and you also walk through a tunnel (now lighted — years ago you needed to bring your own flashlight). 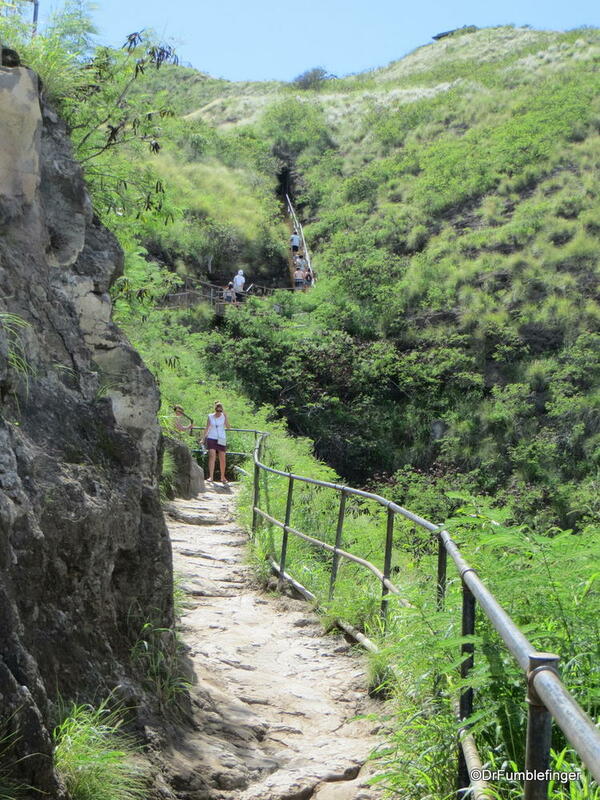 You gain 170 m (560 ft) in elevation during your hike. 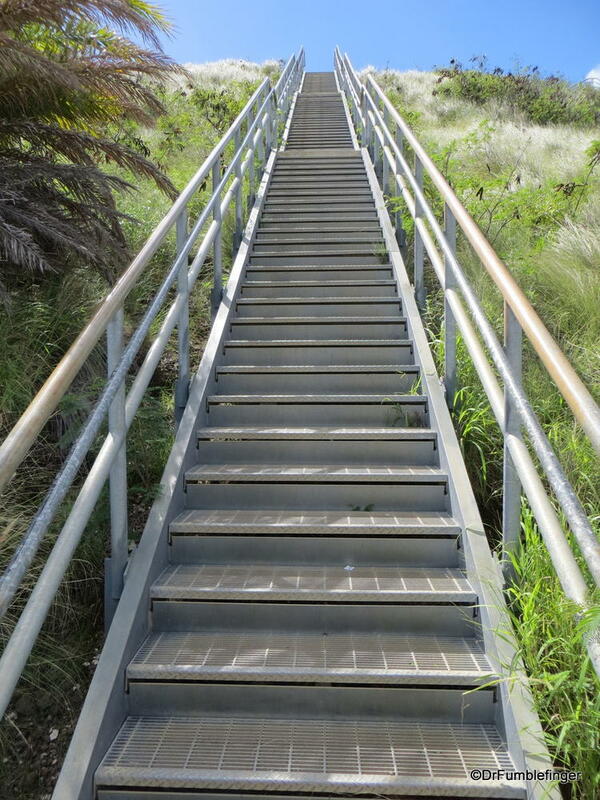 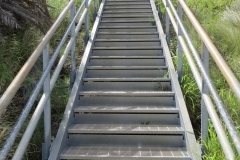 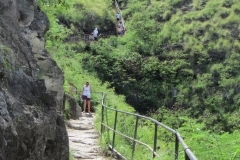 Obviously the hike is not intended for people with difficulty walking or climbing. 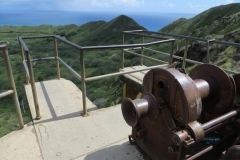 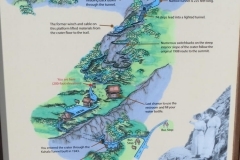 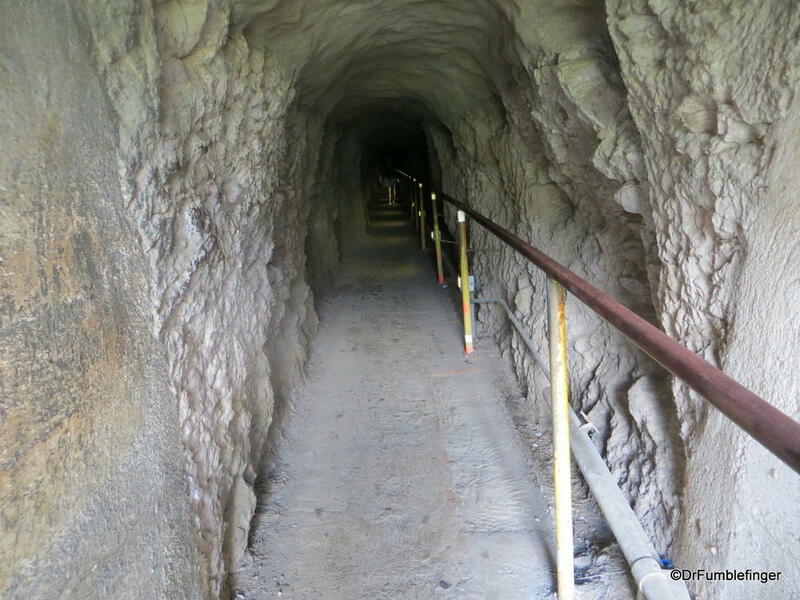 Besides the natural beauty of the area, you’ll see evidence of a number of military observation sites and bunkers along the way, testimony to the site’s role in defense of the Hawaiian Islands. 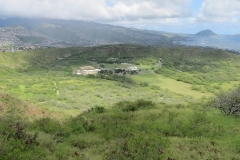 As with all uphill hikes, you do the climb for the views. 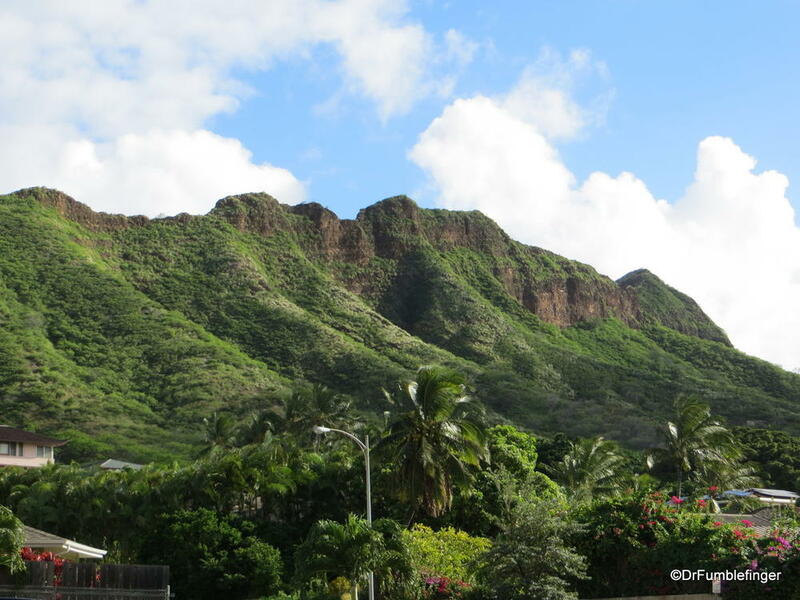 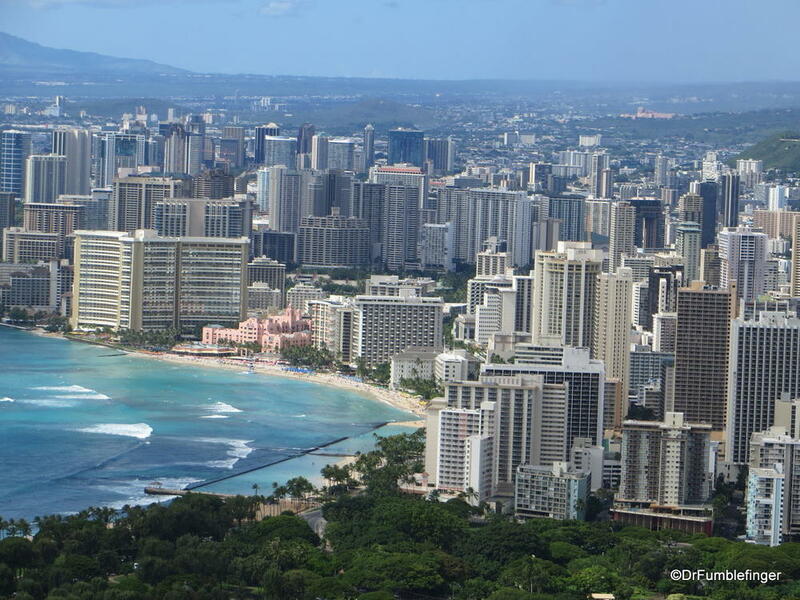 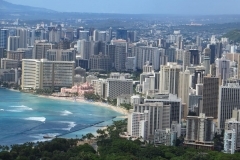 Those from the crater rim are extremely memorable and beautiful, especially of Honolulu! 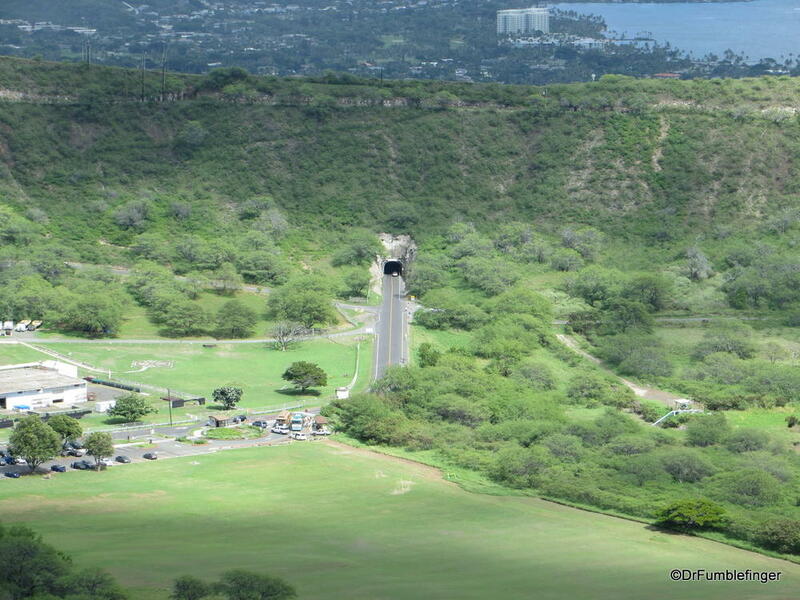 Don ‘t forget to look all around you, including to the north and back into the crater to see from whence you came! 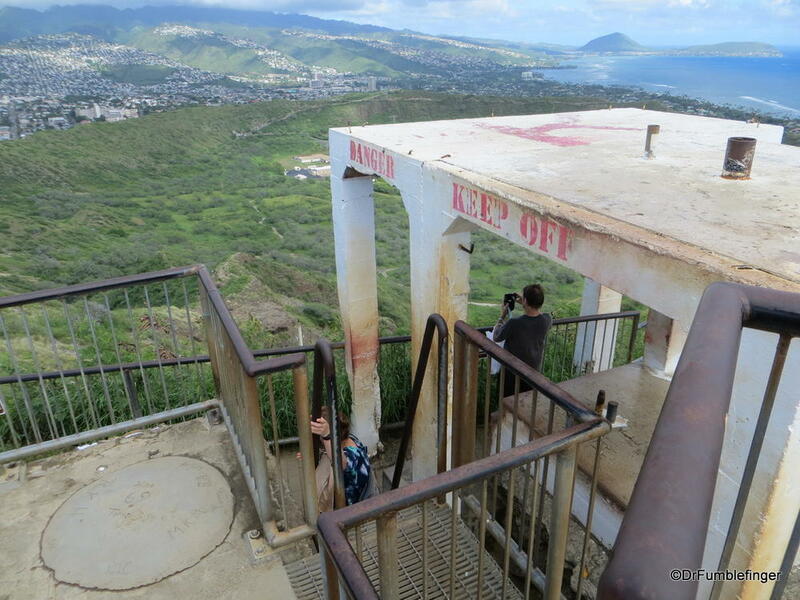 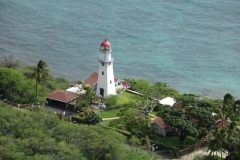 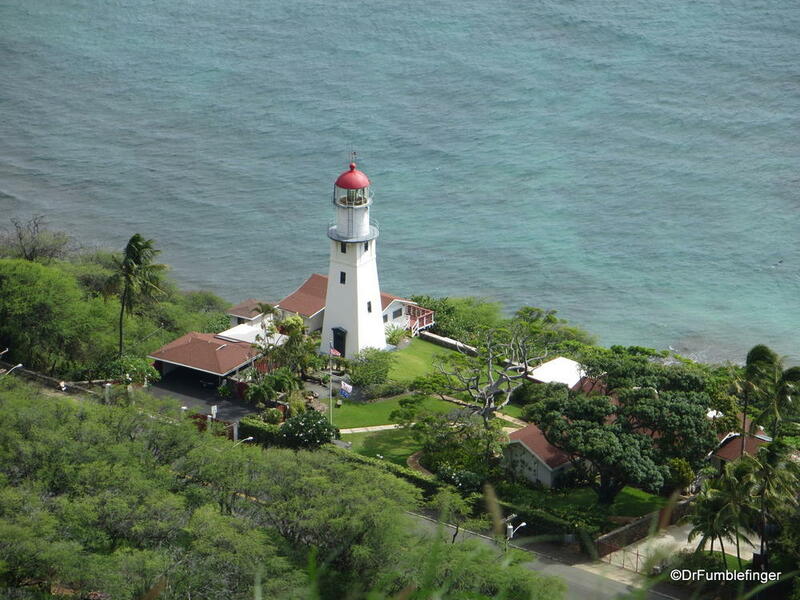 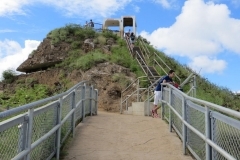 The Diamond Head Lighthouse, built in 1917, is directly adjacent to the crater’s slopes. 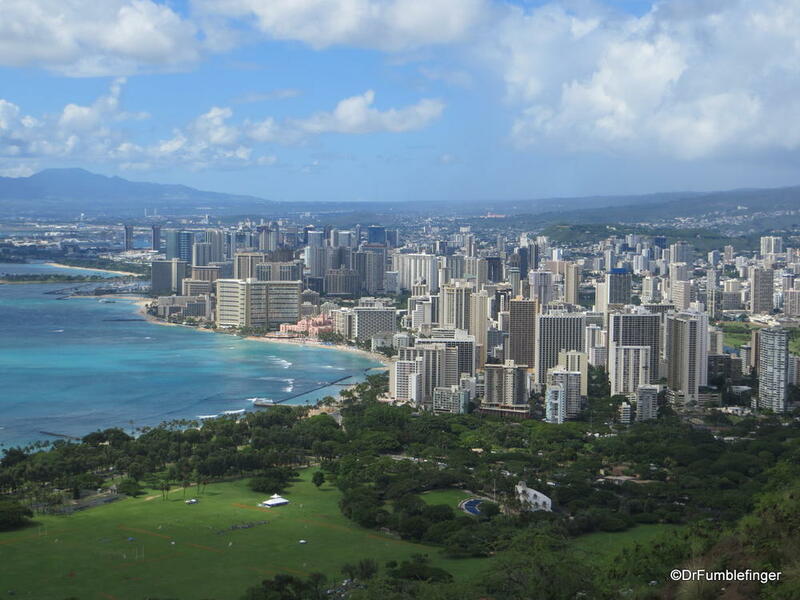 If you’re there in the winter months, you might be lucky enough to see migrating humpback whales. 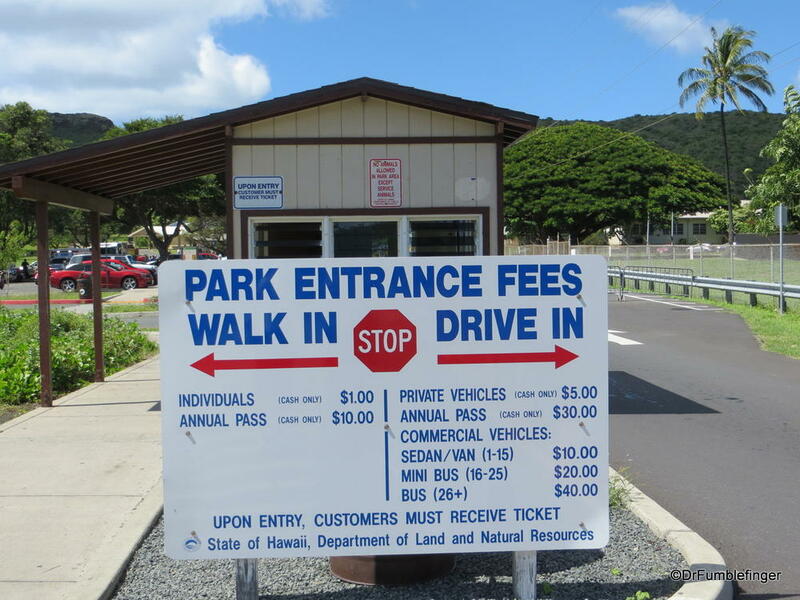 There is a modest admission charge, $1/person when we did the hike. 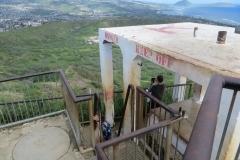 The park closes promptly (gates locked) at 6:00 p.m., so the last hiker allowed up the trail is at 4:30 pm. 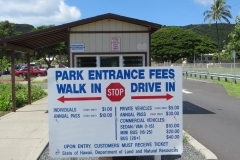 There are washrooms, a water fountain and gift shop located near the trailhead. 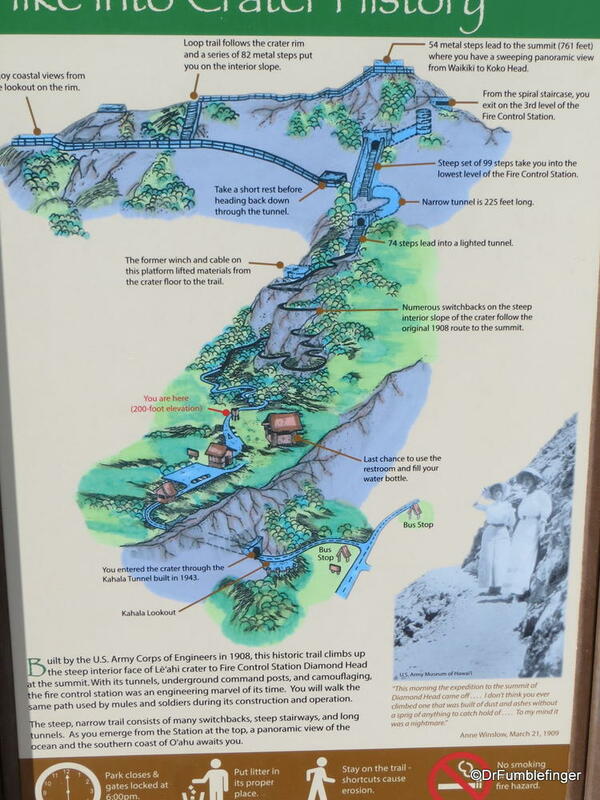 Interpretative signs are found at the trailhead. 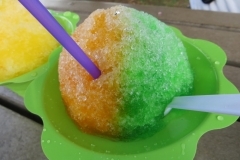 Often there are food trucks where you can get a snack or cold drink. 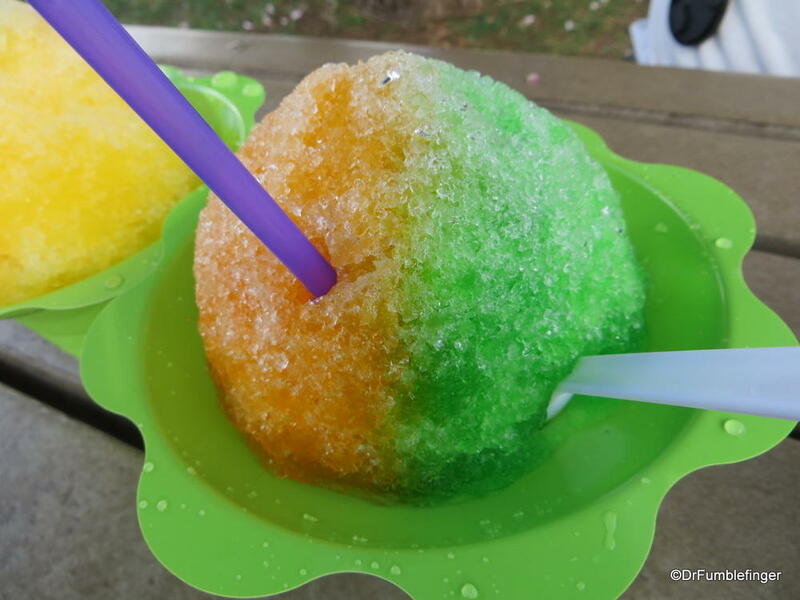 We enjoyed this tasty Hawaiian ice. 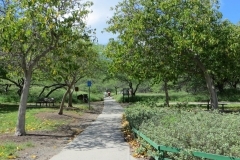 Be sure you have good shoes, a bottle of water and patience as you are not alone on the trail and some people move slowly. 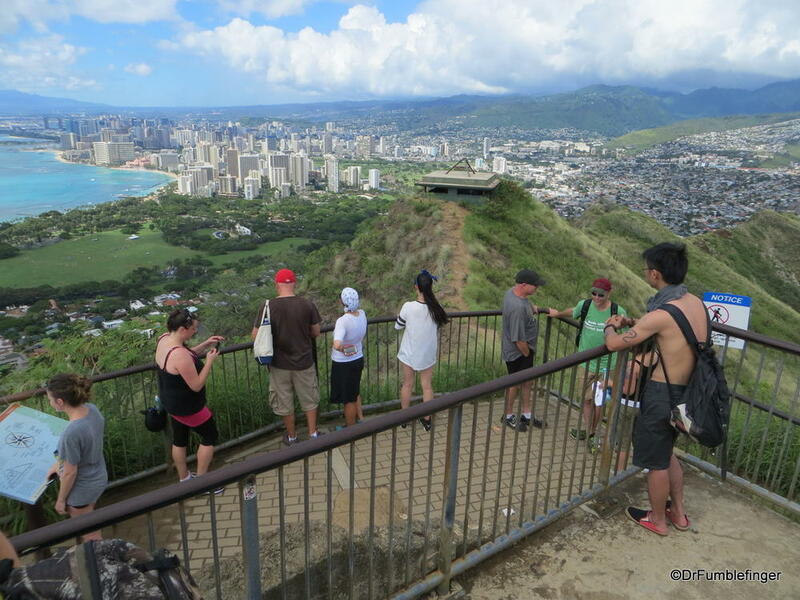 If you’re fair-skinned, wear a hat and use sunscreen. 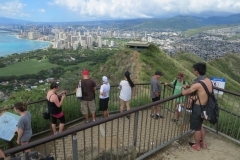 And enjoy the hike!